Seniors and Debt: More Trouble Ahead? Home » Blog » Seniors and Debt: More Trouble Ahead? The number of seniors filing insolvency is growing. Many seniors have the honest intention of paying back whatever debt they accumulate. That would be great, except they’re using new debt to pay for it. We’ve recently written about seniors increasingly turning to payday loans, which is one of the most expensive forms of lending. High interest rates paired with a fixed income aren’t a good combination for anyone. The challenge that seniors are seeing is not that they are incapable of living off of their savings and pension payments. they’re carrying debt into retirement and that’s just a bad plan on a number of different levels. Typically, retired seniors we’ve encountered are becoming more active in their free time. Many are taking up leisurely activities, which add up over time. A large amount of insolvent seniors that we see are living on a fixed income, which means there’s little room to stray off budget. If you’re increasing the amount of activities you’re doing, and you have high interest debts carried over from before you retired, it’s just a matter of time before you have to deal with your debts. The most important thing you can do for yourself is to get educated on how to make your finances work together in retirement. Retired life can cost more if you don’t communicate with your different sources of income. Instead of each income provider (pension, CPP, OAS, etc.) only taxing you based on your income with them, make sure they’re taxing you based on your total income from all sources. This will save you a huge headache come tax season when you realize you owe money because there wasn’t enough being taken off in taxes each year. Use your savings for retirement, not debt. If you’re retired, or heading into retirement and you’re in debt, you should contact a Licensed Insolvency Trustee for advice. What many people don’t know is that your RSP remains protected in a bankruptcy except contributions you made within the last year. This means that instead of using your RSPs to pay down your debts, a consumer proposal may be a better option. You pay back only a portion of your debts over a period of time (up to 5 years) while preserving your retirement savings for your future. Doug Hoyes: Let’s start today’s show with a pop quiz. Which age group has the fastest growing rate of insolvency? The answer, I’m sorry to say, is seniors. As regular listeners to Debt Free in 30 know every two years we do a detailed analysis of all of the data we’re required to gather from all our clients and we discovered a disturbing trend. An ever-growing percentage of our clients are seniors. Four years ago 9% of our clients were aged 60 and over. Two years ago it was 10%, now it’s 12% and I suspect when we crunch the numbers again next year and the year after that percentage will be even higher. So, what’s happening, aren’t senior supposed to be living their golden years? Why are an ever-increasing number of seniors experiencing financial problems? That’s the mystery we’re going to address today. So, to discuss it let’s welcome back to the show today my Hoyes Michalos co-founder and business partner Ted Michalos, Ted how are you doing today? Ted Michalos: Fine thank you, this is a depressing subject. Doug Hoyes: It is, it is but we’re going to hopefully have some practical positive advice to end the show with. So, stick with us on that. So, Ted I want your opinion about what’s happening but before you tell me your thoughts let me tell you some numbers. 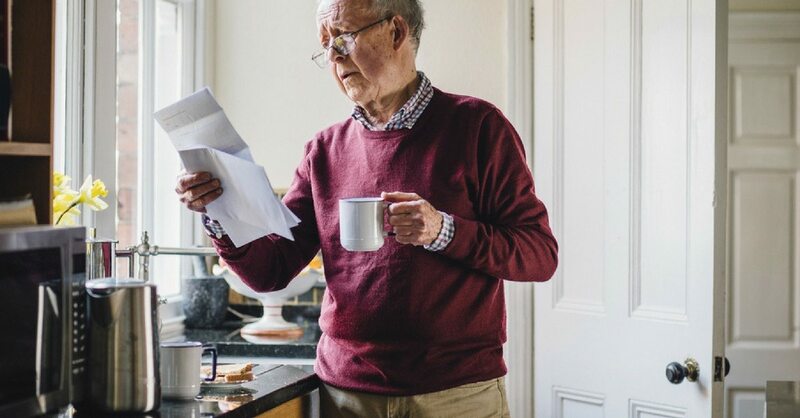 At the time they file a bankruptcy or consumer proposal with us at Hoyes Michalos, seniors have unsecured debt of just over $64,000 which is the highest of all age groups. Ted Michalos: That’s a big number. Doug Hoyes: It’s a huge number. Let’s start with some definitions here. I’m talking about unsecured debt, what is unsecured debt? Ted Michalos: To keep it really simple, unsecured debt is debt that you’ve acquired that has no collateral or anything backing it up. So, I just used the technical term to answer a technical term, that doesn’t help. Let’s do the opposite. What’s a secured debt? A secured debt is a mortgage, a car loan, something that if you don’t make your payments they’ve got the right to come and take that thing away from you. So, unsecured debts are things where they don’t have the right to come and take something. Their recourse is to take legal action against you, try to garnishee your wages, maybe seize your bank account, that sort of thing. Doug Hoyes: So we’re talking about debt with nothing attached to it. Ted Michalos: Yeah, typical examples are credit cards, lines of credit, personal loans, payday loans, income taxes. Doug Hoyes: We’ll get to that, we’ll get to that, just hold your fire on that. Yes, income taxes would also be an unsecured debt. So, there was a recent report issued by Equifax that said that dent excluding mortgages held over those by the age 65 average $15,244 in the fourth quarter last year, so 2016. That was below the Canadian average of $22,000 but those over 65 posted the highest percentage growth compared with fourth quarter of 2015 at 6.1% growth. So, it’s not just in our client base where seniors are taking on more debt. So, Ted break it down for us, how much do seniors who file a bankruptcy or a consumer proposal owe? And I just told you what the general population owes, around $15,000, what do our clients who are seniors owe? Ted Michalos: So seniors, we’re talking about people who are 60 years of age or older, so the unsecured total $65,000, which is significantly higher than any other category and what the average is. So, the average you kind of messed yourself up there, $15,000 was the average for all seniors, $22,000 for all Canadians and our average senior client is $65,000. Ted Michalos: That’s a huge number. Doug Hoyes: We’re quoting a slightly different number than Equifax because they’re defining it as 65 and older. But you get the point, it’s a massive number. Ted Michalos: Yeah, it’s $20,000 worth of personal loans, it’s $25,000 worth of credit card debt, $12,000 worth of taxes and then five or $6,000 worth of everything else. And I know you don’t want me to talk about that yet. Doug Hoyes: Yeah we’ll get to the everything else. Other than that every other category well, I mean when it come to credit cards for example, seniors are the highest – they carried the most debt. Ted Michalos: They carry the most debt. Doug Hoyes: That’s right. So, why? Why is it, why is that seniors have more credit card debt than anyone else? And maybe to answer that question we want to stay away from the technical stuff. So, tell me a story, tell me about the kind of people who you meet with, seniors who have credit card debt. What’s the typical story? Ted Michalos: Let’s talk about a lady that came into to see me yesterday. She is 62 is my guess, she certainly looked much better than that in case she’s listening. She had $75,000 in unsecured debt. Doug Hoyes: So even slightly higher than our normal senior client. Ted Michalos: And the reason for that was at some point five or six years ago she got sick. And so, she stopped looking after filing her taxes and doing anything else. She used to be a vice president for a company. So she was paid very well. Now she’s on long-term disability because she had some health issues. And of that $75,000 she is a little unusual that half of it is income tax because she didn’t file her taxes and now she owes money. The other half was credit cards because what she found was when they put her on the long-term disability her income was two thirds of what it used to be and she didn’t plan for that. She didn’t make adjustments. So, she thought that I’m going to go on making and living the way that I have and suddenly her income was two thirds of what it used to be. And that’s just not a sustainable model. Doug Hoyes: Yeah and obviously I don’t know this person because I wasn’t in a meeting with you yesterday with you yesterday. But in her own defence, it’s kind of hard to adjust your life instantly. Ted Michalos: Well and that’s always the biggest problem that any of our clients experience. Something can happen to your income overnight, you can get laid off, you can get sick, you know, your job can move to Indiana or Mexico or Taiwan and your income just changes. You cannot change your expenses overnight. But as a senior you can plan for some of the stuff. One of the problems they experience is they’re carrying debt into retirement and that’s just a bad plan on a number of different levels. Doug Hoyes: Yeah, you certainly don’t want to be going into retirement without debt. And when we say it’s very difficult to change expenses overnight, well I’m, you know, I own a house. Ted Michalos: Yeah your mortgage or your rent is whatever it is. Doug Hoyes: Mortgage or rent, I can’t change that tomorrow, I can’t instantly break my one year lease or sell my house instantly. Ted Michalos: And everyone says that when you retire your expenses go down, I don’t believe that that’s true. So, you’re not going to work anymore so maybe you don’t need the same clothes. Most of the seniors I’ve ever encountered are becoming more active in other things so they still have all the same expenses and in fact because now there’s more leisure and recreation, some of them are spending more and there’s no income supporting it. Doug Hoyes: Well and they’re spending more time perhaps with their kids and their grandkids and as a result they’re taking them places and so on. So, well, and you mentioned disability, let me give you a couple of more numbers. We know that of our clients who are seniors 56% are retired, okay that makes sense because we’re making seniors a pretty wide swath, 60 year old people or 80 year old people. So, obviously the younger people aren’t yet retired. Six percent are on disability. So, obviously a big percentage of our seniors are living on a fixed income. Our average senior client has a monthly income of $2,141 dollars. So, that’s not a huge amount of money. So, when you talk to your clients, who are having this cash flow issue, where does that money go? Ted Michalos: Well, so let’s continue with these examples of average things. If the average income is $2,100 a month and the average debt level is $65,000, the minimum payments on $65,000 are more than $2,100 a month. Doug Hoyes: And there’s the problem right there. Your debt has to keep going up. Ted Michalos: Right. Now seniors will accumulate new debt to pay old debt because most seniors were brought up on the I have to find a way to pay my bills. And so, even if they went into retirement without debt because they haven’t been able to adjust their living expenses, to make ends meet they will borrow more to make sure they make those payments. And that becomes just a downward spiral. Doug Hoyes: Yeah and you also made the point earlier that the particular person you met with yesterday had had a good job in the past. The only way a senior or anyone can owe $64,000 is if they had good credit in the past. Ted Michalos: That’s exactly right. Somebody had to have – you have to have had a good history to get that kind of debt. Doug Hoyes: Or else there’s no way to borrow. So, we said that seniors owe more on credit cards than any other age group and you explained why. But they also more in taxes than any other age group. Our average client age 60 or over owes almost $13,000 in taxes. Now that’s the average client, some obviously don’t owe any taxes. Forty-seven percent of our senior clients, so that’s almost half, have tax debt. And of those who owe taxes, they owe over $27,000, I guess $26,000 in taxes, which is a third of their total unsecured debt. So, that’s a huge number. So, give me another real life example and you kind of touched on one already of a senior who owed taxes. But tell me the story, why is it that someone would owe taxes and how does it all pan out? Ted Michalos: So, let’s think about John, that’s not his real name, who saw me just a couple of days ago. He now has a government pension and he has an employment pension and he has a survivor’s pension because unfortunately his spouse passed. So, none of these pensions actually plan on the other pension income. So, when they set up their tax deductions, their withholdings, it’s assuming that this is all the money that John’s making. Well, between his three separate pensions now, John’s been pushed into a higher category. So, even if they were taking the proper amount for themselves, he’s jumped up a notch so now they’re all, the amount of tax they’re deducting is about a third lower than it should be. And they’ve been doing that for John now for eight years. Doug Hoyes: Well and this is a really key point. So, let’s emphasize exactly what you’re talking about. I see this very – it almost always happens in the first year of retirement. Doug Hoyes: So I’m working at a job and I’m in the, you know, 30% tax bracket or whatever. They’re taking taxes off my paycheque, I retire let’s say the middle of the year in June, my pension starts in July. So, the pension company which could be a private pension, it could be CPP, OAS whatever it is, all they know about is their pension. So, they say oh, it’s halfway through the year, we’re only going to pay you $6,000 in pension this year so you’re in the 10% tax bracket. And your other pension, the same thing, 10%, the other thing, when you add all those together, everyone took off 10% but you’re really in the 30% bracket. But with your employment income, maybe that pushes you into the 40%, they’re not taking off enough taxes. So the practical advice I guess on this point and we’re going to get to practical advice later but since we’re on the subject what is your advice then for somebody who is – has multiple sources of pension income and is afraid they’re going to owe too much in taxes? Ted Michalos: So, this doesn’t apply just to seniors, this applies to anybody because we have more young people who are working two, three, four jobs part-time instead of that one full-time career. When you have multiple sources of income you need to talk to a tax planer, somebody that can estimate what your total income is going to be so that you can set aside the right amount of tax. So, our advice usually is so if you’ve got say three sources of pension income, maybe what you do is you tell the government to take a lot extra off on theirs so that you know that it’s being paid by one source and you don’t see it, you don’t have to worry about it. And you don’t have to worry about talking to the other pensions. But the trick is to make sure you figure out what that number’s going to be and make a plan to deal with it in advance. Doug Hoyes: Yeah, it doesn’t matter which source of income it comes off of, it’s all going into the same pot. Doug Hoyes: Well and I’ll give you a trick if you don’t have a tax planner or somebody to do this for you. Whoever did your taxes last year, and maybe you did them yourself, you got a computer program whatever, take last year’s tax program, punch in the new numbers and see how much it says you’re going to owe in taxes. And yes, it won’t be right to the penny correct, but it’ll give you at least a ballpark figure and if it says okay, we know how much is coming off, we know how much you’re going to owe, you’re going to owe an extra $1,200 next year, well I guess you better be having them take $100 a month off. Ted Michalos: Yeah. Simpler still, what was the tax bill for last year? If you owed them $1,200, set aside an extra $100 a month. If you owed $2,500 a month, $200 a month, it’s all pretty basic but you have to take the time to think it through. Doug Hoyes: Yeah that of course assumes your income’s going to be comparable, which it usually is if you’ve been retired for a year. The other place I see seniors getting into massive tax trouble is with RSPs. So, you take money out of your RSP to help pay the taxes or other living expenses and now you owe money on RSPs. So, how does that happen? Ted Michalos: So the whole plan with RSPs from the government’s perspective was that you would take that lump sum of money, you would turn it into annuity that you’re getting from a life insurance company or someone else so you slowly draw that money down over time so the tax burden shouldn’t be significant. But what you were just talking about you’re going to have to take a lump sum out. And so I’m getting two or three pensions, I’ve got a comfortable living and for whatever reason I needed $2,500 or $3,000 as a lump sum. I take that out as one chunk of money, they’re only going to withhold a little bit of tax on it but you’ve taken yourself from a low tax bracket to a very high tax bracket because half of that money you withdrew probably should have been set aside for taxes. Ted Michalos: Well, on top of that your investment advisor will tell you to do it that way so they only take the 10% off so you get more of the money. Doug Hoyes: Yeah but you still owe the tax on the whole thing at the end of the year. So, we see that as a very common thing so again, think about this before you start taking money out of an RSP and make sure you’re setting aside the tax. Ted Michalos: Well and you know what the kicker is? Folks you should be contacting somebody like Doug or I before you start taking money out of RSPs to deal with debt. Money in RSPs is protected. So, I know you’re thinking I’ve got to deal with this debt, there are better ways to do it. Doug Hoyes: So what are you talking about? Ted Michalos: Well, so let’s say that you’re this average senior that owes $65,000. But you’ve got money in an RSP. Well, so if you had $100,000 in an RSP and you took it out, you could pay off the $65,000, the other $35,000 would go to tax and you’d have nothing. Or you could file a proposal to your creditors to repay a portion of $65,000, the RSP is protected under law so you’d still have it and you could deal with this over time. Probably the proposal you’d pay back $20,000. That might be another show. Doug Hoyes: Yeah and we’ll put some links in the show notes over at hoyes.com that explain this in more detail. But the quick version of it is if you file a bankruptcy, the trustee, us, isn’t going to take your RSP except to the extent of whatever contributions you’ve made in the last year. Ted Michalos: Yeah we’re just not allowed to, they’re protected. Doug Hoyes: It’s federal law, federal law says we cannot take your RSP except for what you’ve contributed in the last 12 months. Yeah but it also doesn’t make sense to do exactly what you just described. I’ve got $100,000 in my RSP, I take it out, I got to pay 30 or 40 grand in tax to pay off my $60,000 so now my debts are gone but also my RSP is gone. I’ve lost $100,000 to pay $60,000 in debt. It might have made more sense to file a consumer proposal where over time we offer to pay 20 or $30,000. Ted Michalos: My advice would be to take that $100,000 turn it into a RIF so you’ve got a monthly stream of income coming from it and use that monthly stream of income to pay the proposal. Doug Hoyes: And obviously again we’re not giving investment advice here. And RIFs you have to be a certain age and all the rest of it. Ted Michalos: The important thing is to recognize that there are options other than just liquidating everything that you own. Doug Hoyes: Yeah so if you have a lot of debt, talk to a Licensed Insolvency Trustee such as us. And if you’ve got an investment advisor, talk to them as well. But make sure you talk to both because Ted gave a perfect example of the investment advisor trying to do a favour by having you take your RSP out in little pieces, which is great for cash flow this year but is horrible for next year. So, okay final point and again we’ve talked about taking RSPs out to pay taxes and other living costs, you end up owing even more in taxes and it ends up being a vicious cycle. And so well, what happens when you’re in a vicious cycle like that? Well, this is a topic we’ve discussed many times. In fact it was the topic on our very first show, that was 143 episodes ago, back in 2014. Ted Michalos: Back when we were young men. Doug Hoyes: When we were just kids and that was of course payday loans. Eleven percent of our senior clients have payday loans. Well, and I like to get you going by mentioning it. Ted Michalos: Yep. Always comes back to these damn payday loans. Doug Hoyes: Our senior clients owe a total of almost $3,600 in payday loans. So, again only 11% of them, only, I say only, only 11% of them have payday loans but it is a massive number, $3,600, which may not sound like a massive number but it’s a massive number when you figure what the cost is. So, tell us a final story here Ted about how it is possible for a senior to get into payday loan trouble. Doug Hoyes: Yeah I think the word is honorable. Ted Michalos: Honorable. There you go, that’s honourable. No good deed every goes unpunished. They find a way to make the payment and unfortunately what that means is once they’ve maxed out their credit cards, maxed out their lines of credit, used any savings that they have, well if they need quick cash in the little of the month to make that loan payment they go get a payday loan. And so, let’s do some math about payday loans. You borrow $500 and you’re going to pay them back in two weeks, $560. The interest rate is something ridiculous, 548% annually. Doug Hoyes: Yeah, the maximum a payday loan company in Ontario can charge, and we’re recording this in 2017 and numbers were higher last year and they’re scheduled to go down again next year but it’s $18 on 100. So, if you borrow $100 for two weeks and pay it back, you’re paying back $18 obviously, which sounds like 18%, 18 out of 100, but no, it’s 18 over two weeks, you could multiple that by 26 weeks, that comes to 468% annual interest. That’s why we say it’s a massive number. Ted Michalos: Well and now take this $3,600, so 36 times 18, 360 plus another $270, it’s $630 a month of interest charges, plus you’ve got to repay the loan. Doug Hoyes: Yeah and when you’re on a fixed income, it’s just impossible. Ted Michalos: And what was that average fixed income we had? Doug Hoyes: Just over $2,100. It’s impossible because I’ve still got to pay my rent and buy my groceries and everything else. So, it’s just not possible. So, you run into seniors who get into this situation. And it’s essentially they’re honourable people, they want to pay their debts but they just can’t. Ted Michalos: And again you hit it on the head, they deluded themselves into thinking that $18 for $100 in two weeks is 18% interest. So, okay it’s expensive but no more than a credit card. It’s just not true, it’s 548% interest, it’s ridiculously expensive. Doug Hoyes: Yeah, so we’re not big fans of payday loans in case you didn’t read between the lines there. Okay so we’ve now had like three depressing stories in a row about fixed incomes and payday loans and so on. I don’t want to end the show on a depressing note. Ted Michalos: Let’s talk about something positive. Doug Hoyes: So yeah let’s end with some practice advice for seniors with some debt. So, if you’re a senior, this is advice for you or if you are parents who are seniors and I mean just yesterday I met with a lady who brought in her mother. So, it’s very common to be helping out your parents even if you’re an adult. So, this is also for you, you may be the only person who can talk to them and give them some advice because again, seniors have paid their bills their whole life, they’ve always had good credit, they’ve never been in this situation. And now they’re on a fixed income and they just can’t do it. Ted Michalos: It’s issues of pride. Doug Hoyes: Yeah and we’re all like that. So you may be the only one who can actually reach out to them. So, Ted you’re meeting with someone, you’re talking to someone who’s got debt or the child of a senior who’s got debt. Give me some practical advice, things that they can do to deal with that debt. Ted Michalos: Alright. So, the most important single element is to make sure that they’re not going to incur any new debt. So, we’ve got to find a way to make them live within their means. Not as much income is coming in. That’s what they’ve got available to live on. So, if it costs them more to live than they’ve got coming in and they’re accumulating more debt and whatever solution I come up with to deal with the debt isn’t going to work because the debt’s just getting bigger every month. Doug Hoyes: You’ve got to deal with the underlying problem. Ted Michalos: Number one that’s right, deal with the underlying problem. Then number two, alright let’s get a handle on just how big the debt is so we’re going to do an inventory, credit cards, personal loans, payday loans, income tax, figuring out what the debts are, what the interest rates are on these debts and let’s try to prioritize so we can rid of the highest most expensive debts first. Now in most cases when somebody comes to see us there’s more debt than can be dealt with in any kind of prioritizing. There just isn’t money available to pay off the payday loans and then the credit cards and then the lines of credit. So, we need a scheme that’s going to be more all encompassing, more global, which is when we start looking at some of the legal options that people have, proposals, bankruptcies, debt management programs, that sort of thing. 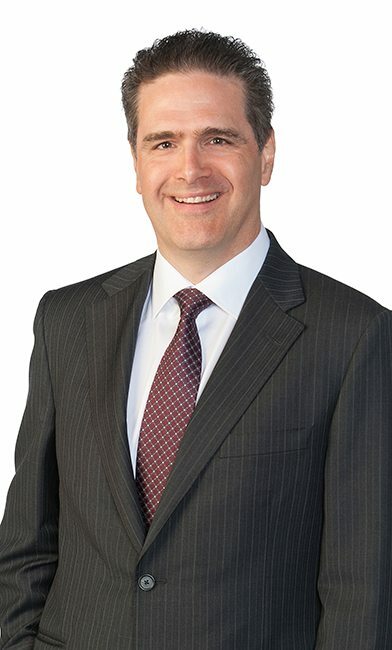 Doug Hoyes: Yeah and we do a lot of consumer proposals for seniors because if they’re on a fixed income, I mean I see it all the time they’ve got their pension but maybe they also work part-time. You know, put in a couple of hours a day at a local garden centre in the summer, they, you know, work at a summer store or whatever. So their income is high enough that they can afford to pay something back, they just can’t pay the full amount back. Ted Michalos: And in all honesty, they generally feel better about that solution than the bankruptcy. There are times when bankruptcy is the right answer folks, it means you cannot deal with the debts, you should walk away from it. There are also times when people will say you know what? I will go out and get that job so that I can repay a portion of the debt. Now we’re back to the whole honourable senior, the pride goeth before the fall. Doug Hoyes: Yeah they want to do it. And I think that’s a good thing. I think taking responsibility and saying yeah, you know what? Stuff happened but I still want to deal with it is totally a good thing. And just to be clear here when you come in to see us we’re going to talk about all the options, we’re not going to say oh well, well you have to file a proposal, you have to go to bankruptcy. We’ll explain the costs of both and let you decide. I want to give one final piece of advice here and that is I am not a big fan of loaning money to adult children. Ted Michalos: There’s a reason for that. Doug Hoyes: And the reason is they, you know, may not be able to pay you back. I have dealt with, and I’m sure you have too Ted. A lot of seniors who come in and I go well, you retired a couple a years ago, everything was great, you had money in the bank, you had money in your RSPs and now you got all this debt. What happened? Well, my son, my daughter got into trouble, they lost their job, they got divorced so I helped them out, I made their payments, I did this, I did that. Unfortunately I didn’t do it with the cash I had, I used up all my cash and then I had to start borrowing. I am not a big fan of borrowing to help someone else which then puts you into a situation where now you need help. Ted Michalos: Yeah all you’re doing is empowering the person that had the underlying problem. Now I mean you never stop being a parent, Doug and I both parents, we get it. In fact Doug’s kids are at the point where they’re going to start borrowing from him soon. Mine are a little younger than that. You’re not actually helping somebody out, it’s like that investment advisor that was telling them how to get the most cash out of your RRSP by taking it out in little pieces. Well, it’s creating another problem later and the other problem is always bigger. So you need to find a way to help your children without incurring it yourself or living through your savings. Doug Hoyes: That’s the key. And I’m a big fan of helping people out; I think you should help your family out. I just don’t think you should go into massive debt to do it. So, if you’ve got an extra 50 bucks a month and you want to help your kids by giving them the 50 bucks, that’s your money, fantastic do it. But you hit on a key point, find other ways to help them. So, okay if the cost of daycare is getting to you, why don’t I look after your kids a few days a week, it saves on the daycare but doesn’t cost me any money if I’m home and retired anyways. Ted Michalos: And we should warn people. We have seen extreme cases of this. In my own practice, I work out of our Guelph office on a regular basis. We referred three different cases to the local police over the last five years of elder abuse. So this was their children borrowing from them to the extent that they used all of their assets and then ran up all of the senior’s debt and then left them high and dry where they couldn’t deal with it. Ted Michalos: In those cases it was criminal. Doug Hoyes: And I mean those are extreme cases. Doug Hoyes: I think the bottom line is you’ve got to think before you’re incurring any debt but the good news is there are solutions out there to help with all of this. Doug Hoyes: So, if you were faced with debt issues, like I said, give us a call and we’re more than happy to help you walk through it. Ted Michalos: It’s like anything else that you’ve experienced in your life you’re at the point where you’re supposed to be enjoying your golden years and so if there’s a – if you’ve encountered a problem that you’re not familiar with like having more debt than you’ve ever had before, talk to somebody that specializes in debt. It could be somebody at the bank, it could be a counsellor, it could be somebody with your church or perish, it could be somebody like Doug or I. You need someone that knows how to deal with these issues so that they can point you in the right direction. At the end of the day you’re going to make the decision. You’re the adults, you decide what’s right for you. But you need to get good information. Doug Hoyes: Excellent. Well, I think that’s great advice and I think that’s a great way to end the show. So, here’s my advice, debt problems don’t go away on their own, that’s what Ted just said and it’s particularly difficult if you’re a senior on a fixed income. It’s not like you can work a whole lot of overtime to make up the difference if there is no overtime because you’re not working. So if you have more debt than you can handle, get help. And if your parents have more debt than they can handle, get them help. You can call our 310-PLAN hotline and talk to an expert, the phone call’s free, the initial consultation’s free, get the peace of mind today, simple as that. That’s our show for today. Ted, thanks for being here. Ted Michalos: It was a pleasure. 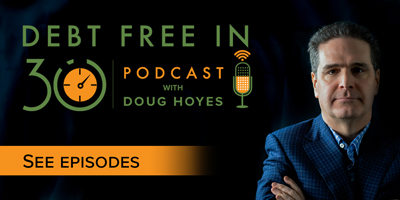 Doug Hoyes: Full show notes including a full transcript of today’s podcast could be found at hoyes.com that’s h-o-y-e-s-dot-com. Until next week, I’m Doug Hoyes. That was Debt Free in 30.